I bought this jacket for my niece in the whiskey color. The color of the jacket is beautiful but the jacket for too tight in the arms for her. I returned the jacket and bought a larger size but they don't have the whiskey color in a larger size so I go her the same jacket but in black. Sleek and classic, this racer jacket features a stand-up snapcollar and rivet details. Crafted from lambskin leather, thistimeless leather jacket is available in black, brown, and olive. Gorgeous olive green color - unusual for leather jackets. The leather is soft, nice quality, no unpleasant odor. Fits true to size and all zippers/snaps are smooth/functional. Not a huge fan of the puffy shoulders- on my body type it adds unnecessary bulk. Overstock originally shipped the wrong size, but it was easily returned and replaced with the correct size. As always, 5 stars for Overstock customer service. I still have not worn this jacket because I’m looking for the perfect pair of boots/booties to wear with it. This jacket is like BUTTER, so very soft and no weird smell. If you were hesitant about this jacket, hesisitate no more, it’s beautiful! I think I’ll add oil to the cuffs and any are where my hands may come in contact with the leather to add distressing. Even without distressing, this jacket is amazing and the price, I’ve seen faux leather for three times more! I bought this for my 13 yo as this age are all about getting a black bomer type jacket. I didn’t want to spend a ton yet didn’t want a cheap feel to the leather/ vinyl type material you see 100 dollar jackets are made with. This one hit the mark. It’s the softest feel and notocobly nicer than other jackets but for the same price. I love this jacket! Outstanding quality for the price. Fits perfect, true to size. Far exceeded my expectations! This jacket isn't lambskin. The leather was so stiff & thick that I couldn't bend my elbows. It's otherwise fine & fits as expected. It just isn't soft buttery lambskin. The tag itself indicates "leather." 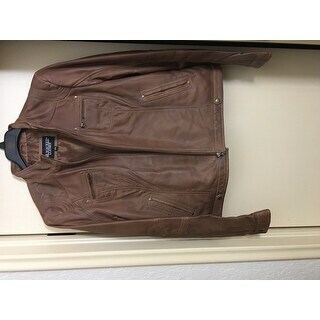 This is a true lambskin leather jacket. It is soft and light but at the same time tough and rugged. It fits perfectly and is pretty comfortable to wear too. It is snug/slimfitting and that brings out its beauty even more. Love it. Very high-quality leather jacket. Looks great and feels perfect. The fit is correct. I would definitely recommend! Beautiful jacket. Leather very soft. A bit more on the slim fit side, but a gorgeous jacket for a very good price.. I love the style, look, fit of this jacket & it's super soft. BUT, as my son says, it smells like lamb stew. It smells gamie I have it outside to air out and spray lots of body spray inside the jacket. Does anyone know how to get the smell out of this gorgeous jacket? Super cute, exactly what I expected. I love it!